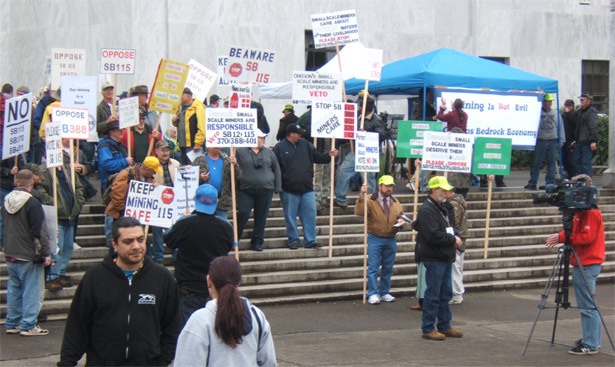 Hundreds of miners gathered at the Oregon State Capitol Building on February 28 to rally against several recently introduced bills aimed at restricting mining in the state. Oregon Senator Alan Bates introduced a series of bills aimed directly at placer miners and other landowners in Oregon. SB 401 would designate numerous waterways as "scenic" to restrict suction gold dredging and other methods of placer mining. SB 370 imposes a $125 fee on placer miners, and would apply to private, state and federal lands, while imposing penalties of 30 days in jail and a $1,250 fine for violations. SB 115 would outlaw suction gold dredging and prohibit many forms of motorized placer mining in or near waterways. It includes a proposed fine of $6,250 and one year in prison for violations. SB 12 bans all vehicles with a gross weight of 200 lbs from any river bank or bed, which would limit access to mining claims. Gary Earle of Capitol Prospecting in Oregon stated that several senators came out on a rainy day to support the miners. "I would say it was a very, very successful rally," said Earle. Senator Herman Baertschiger Jr. thanked the miners for coming out on a rainy day and expressed his commitment to defeat the bills. Senator Ted Ferrioli stated, "It's been said that no man's property is safe nor life secure so long as the legislature is in session. Now you know what those words mean." "As a matter of fact, most of the miners in my district tell me anecdotally that the fish kind of like to swim up behind them and eat all the bugs and stuff that come up. This gentleman corrected me and he was right -- I said 'recreational,' but for many of the folks in my district it's a business. It's how they keep their bodies and souls and their families fed. ...When they came after loggers, they didn't say very much. I did -- lots of other people didn't. What happened to logging? "The fishermen sort of stood around and watched the logging go away because they were kind of convinced that logging was killing fish. And then we started to draw circles on the ocean, remember? We started to put in ocean reserves. We didn't learn very much when we started to draw cirles on the forest for the spotted owls. We just killed a lot of forest. And guess what? The spotted owls are dying too! So what was wrong with this picture? "The lesson for me is this: whenever you separate a group of people -- an advocacy for a natural resource -- the resource dies. Let me repeat that. Whenever you separate people who are in advocacy -- like you are for mining -- from the natural resource, the natural resource dies. "Let me just tell you one other thing. Here is something I have confidence in. When a miner gets a permit... and he has to work with the department of Fish and Wildlife and the Division of State Lands, that's the most regulated guy in the United States of America. And if he has a permit, he's legal. He's not harming a thing! "I've been getting lots of mail from you folks and I appreciate that. I will tell you I will be happy to vote 'no' on Senate Bill 115, Senate Bill 370, Senate Bill 401, and do everything I can do to help other people understand that this wild and scenic rivers thing is a dodge. And other people, besides miners, are going to be hurt if this passes." Additional constructive comments were presented by Tom Kitchar, president of the Waldo Mining District, and local radio host and property rights advocate Kerby Jackson.